Synopsis: Zara and Nick are soul mates, meant to be together forever. But that's not quite how things have worked out. Review: 4 Stars - Entice, the new book in the Need series by author Carrie Jones picks up right where we last left Zara, Nick, Astley, Issie and Devyn. The action never stops for long in this thrilling third installment. Jones’ story and characters continue to grow with each book in this fun, entertaining and adventurous series featuring Pixie’s and various otherworldly creatures. Its Jones’ writing that makes these books and the book to come a must read for anyone who loves a story about good and evil and love and hope. Zara has lost a lot in the last two books and in this one she’s working hard to get some of those lost things back. She’s changed… in more ways than one. She has had many hard choices to make, some of her friends and family didn’t understand. She’s a character I enjoy reading about as she continues to fight for what she believes in and knows is right and now she continues to fight for her friends and family as well. And while there are is a lot of action there are a few slower spots here and there as well, but as a fan of everything Jones, her writing and this series has to offer, it didn’t take away from my overall enjoyment of this book. All in all I more than enjoy this series. I was excited to get a chance to read it early. After reading Captivate I couldn’t wait to see what would happen next and what a thrilling ride it was with Entice. Jones has such a core group of characters and solid writing that any fan of paranormal books shouldn’t pass these by. Be sure to start with the first book in the series – Need and be ready to for more with Captivate. Enjoy! Don't forget to check out the Facebook page for your chance to win a FLIP Video Camera! It's easy to enter, just tell them what your dream cast would be if they made a movie for the NEED Series! And coming soon... a Pixie Kiss App! Send your friend a smooch from Zara, Nick or Astley! Enter to win a copy of Entice (Need, #3)! ONE winner will receive a copy of this book. To enter, you must fill out the form. No entries in comments please, they won't count. Sorry. This giveaway is open to US residents only. NO P.O. Boxes either, Sorry. TO ENTER, PLEASE COMPLETE THIS FORM. This giveaway was made possible because of the donation from Bloomsbury. A HUGE Thank You goes out to them. please feel free to read my policy page or send me an email. Thanks for entering and good luck to everyone. FTC Disclaimer: I did NOT pay for this book, nor have I been compensated at all in any way or means for reading and writing this HONEST review. Nor have I been compensated for hosting this giveaway. This series sounds really good. I haven't heard of it before. I'll have to check it out. Great review, and thanks for the giveaway! Love this author and this series! Thanks for the great giveaway! I've got to read Captivate - which is on my shelves - and then I'll get to this one. Glad to hear it's so good. Thanks for the review! I hear Astley is wicked hot in this book. I dunno I might just have to switch sides here. Thanks for the review. 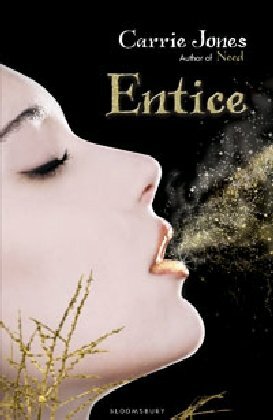 I loved the first two books and am dying to reading Entice. Thanks for the wonderful giveaway!